At the risk of starting this review on a morbid note, the sudden and unexpected deaths of music giants this year has been nothing short of brutal. David Bowie. Prince. Paul Kantner. George Martin. Just the other day Alan Vega left us. So when an ex-Beatle plays in your backyard, it’s a good idea to live in the moment and get into the show. Plenty of people took that line of thinking, and the creaking joints of Fenway Park were put the test with throngs of fans both young and old filling all available spaces. Why not? The temperature was perfect, no rain in sight, and they were about to be served some prime slices of rock’s best output. Sir Paul got off to a rousing start, and pretty much kept that pace throughout. Sure, everyone wanted to hear the chestnuts of Beatles and Wings songs that they know so well, but he’s still got a bit of petrol left in the tank. “New,” the title track from his 2013 LP, was a bit of watered-down Beatles, but “Queenie Eye” had the right amount pop swagger and bounce to get the crowd going. The night started out with early Beatles hits (weren’t they pretty all hits?) “A Hard Day’s Night” and “Can’t Buy Me Love,” until he flipped the calendar a handful of years forward and dug into some Wings material. “Letting Go” was likely one of the more obscure songs that McCartney would play (along with a true relic, “In Spite Of All The Danger” by the pre-Beatles Quarrymen), and he hit some of the bigger tracks such as the piano-fueled “1985” and “Let Me Roll It,” the latter being covered by The Melvins, a band more known for their dirgey sludge attack than keen appreciation for a well-written pop tune. 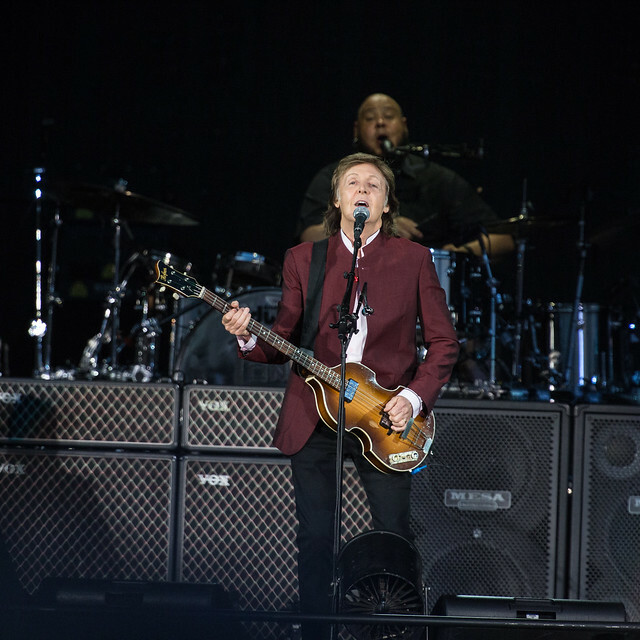 Throughout the night, McCartney effortlessly moved from his trademark Hofner bass to guitar, to piano, and to acoustic guitar. His vocals are showing some effects of his seven-plus decades on this globe, with “Maybe I’m Amazed” showing some of the loss of range and power. Still, it really didn’t matter as it came as a heartfelt paean to the late Linda McCarthy, the screen backdrop showing vintage photos of her and their time together. McCartney didn’t forget his current wife Nancy, and he dedicated “My Valentine” to her. The most touching tribute of the night, however, had to belong to his version of George Harrison’s “Something,” arguably Harrison’s finest song with The Beatles. Starting out on ukelele, McCartney described Harrison’s prowess on the four stringed instrument as he played it up tempo, solo. Halfway through the song he transitioned to guitar, and the band kicked in at full power with photos of George, solo and with his band mates, projected onto the screen. The more cynical might say it was calculated nostalgia, but I’d reckon it was a touching tribute to a departed friend. Picking out highlights of the regular set are difficult when thirty-two songs were played, but the swinging version of “Lady Madonna,” the piercing airplane sounds of “Back In The USSR” (fun fact – after McCartney became the first band to play in Red Square, he commented that state officials were swarming the back stage area and one claimed that he learned English from listening to Beatles songs) and the pyrotechnic-fueled attack of “Live And Let Die” had be near the top, starkly contrasting with the equally lovely but polar opposite acoustic set of Beatles songs. “We Can Work It Out,” “And I Love Her,” “You Won’t See Me” and “Love Me Do” were set in a faux-wooden porch setting, while tackling “Blackbird” alone, it melted away as the stage rose several feet in the air, McCartney at the top of the perch. Following the overrated and frankly monotonous “Hey Jude,” the regular set gave way to the encore. Once a perfunctory version of “Yesterday” was over, the special guest parade started. As Dead & Company played the previous two nights at Fenway, apparently Bob Weir decided to stick around in Boston and got pressed into service for the Wings’ “Hi Hi Hi,” a subject matter he’s clearly familiar with. It got a bit more surreal when the next guest was introduced, none other than Rob Gronkowski, the towering tight end of the New England Patriots. As he can’t really sing and dance, he just went straight to Gronk party mode, miming air guitar as the band launched into “Helter Skelter.” Ok, I’ll never see that again. A fitting wrap to the evening was the ending medley of Abbey Road, starting with Paul back on piano for “Golden Slumbers,” “Carry That Weight” and “The End.” No “Her Majesty,” thankfully. Even Paul recognizes a daft decision in hindsight.